Mold growing in the bathroom is quiet a common thing, especially in the overly humid New Jersey climate. Your first natural reaction would be to remove bathroom mold by yourself and move on with your life. However, there are few things you need to take into consideration first. To be 100% certain that you don't have a serious mold contamination problem on your hands, it is recommended to have a professional mold inspection. At Above & Beyond Unlimited Cleaning, our certified mold inspectors will be able to reliably determine the exact size and state of your mold problem, as well as advise whether or not your case require a professional bathroom mold removal services. Mold requires four things in order to grow: source of moisture, organic source of food, supply of oxygen and warm temperatures. Of these four, excessive moisture is the main reason for mold to start growing in the first place. Note: Simple preventive measures such as squeegeeing shower walls and wiping the floors and surfaces dry every time, can prevent mold from growing in your bathroom. Where does Mold Grow in the Bathroom? How Dangerous Bathroom Mold Really Is? Mold in bathroom doesn't pose immediate danger to your health comparing to other possible places around the house. Mold contamination in the bathroom is often isolated due to the fact that most of the surfaces in the bathroom are tightly sealed. There is also a little chance for the mold to become airborne, since it has to be dry for a while before starting to release spores in the air. Thoroughly inspect the area surrounding the mold: check if there any cracks, cavities or holes that could lead water to the internal wall and floor structure. Check out the integrity of all surfaces and seals around the bathroom – very often visible mold is just a tip of an iceberg and cold be a sign of a more serious problem, where mold could be growing for a long period of time without being noticed. 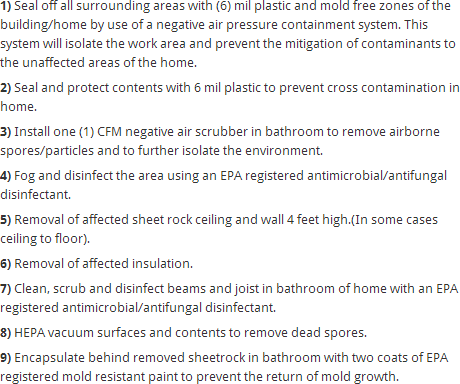 Our bathroom mold remediation process follows EPA guidelines and utilizes best materials and equipment in the industry. Need more information? Check out our sample mold remediation protocol. For the past 21 years Above & Beyond has helped thousands of residential New Jersey clients to feel safe in their homes again. Our dedication to 100% customer satisfaction is one of the many reasons why clients love us! Learn more about our conventional and non-toxic mold remediation services or call (732) 490-5900 for a free over-the-phone consultation now! Somerset County, Cape May County, Hunterdon County, Union County, Salem County, Sussex County, Middlesex County, Atlantic County, Gloucester County, Morris County, Warren County, Mercer County, Hudson County, Monmouth County, Bergen County, Essex County, Burlington County, Passaic County, Cumberland County, Camden County, Ocean County.